Funboard Center Boracay will send the best windsurfer of the windsurf school to compete the first RS:1 One-World-Championship on Boracay Island. Gido Gelito has grown up on Boracay Island and nobody else knows the wind- and water condition at Bulabog Beach better than him. Kiteboarders and windsurfers on Boracay watch out: Predictable strong winds ahead! Great forcast for the coming weekend. Finally the Amihan wind comes back to Bulabog beach. Kiterboarders and windsurfers on Boracay can't wait to catch the expected 30 knots! Read more about Kiteboarders and windsurfers on Boracay watch out: Predictable strong winds ahead! We are back on Boracay and will get ready within the next 2 weeks to welcome you. We have some new equipment, instructors and recipe!!! waiting for you. The count down has started! Only a few days left and the Habagat season comes to an end. 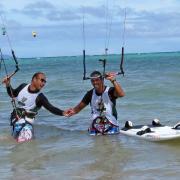 Our team is looking forward to the coming kite-and windsurf season at Bulabog Beach. The funboard center boracay will be open end of October. 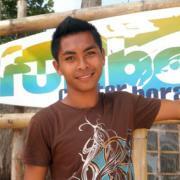 Welcome at funboard center boracay. The next entries will give you some impression from the start of funboard center boracy and the last 3 years of activ kite- and windsurfing at one of the best spots in Asia. Next to all the amazing results, we had a great time and a very crazy team. Gil & Glynn are not only pros in windsurfing and kiteboarding. To what ever watersport it comes- they will make it: Gold in 500!